The 8-speed Shimano derailleur has small gears sufficient to drive the Pedalofit 2 even with short crank settings and minimal power usage. 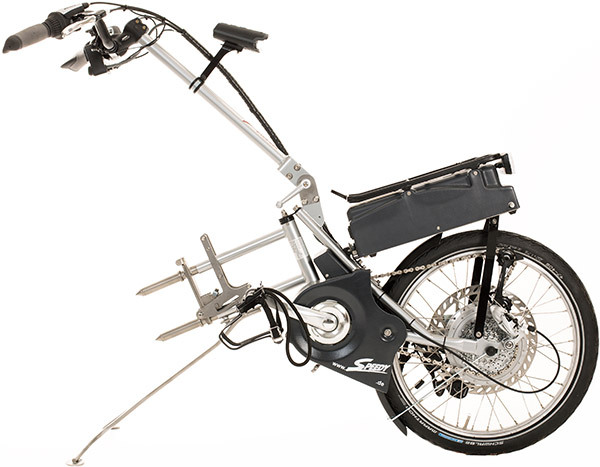 The gears can be operated using a grip shift on the handlebars, which can be mounted on either the left or the right. The Speedy Pedalofit 2 can be individually adjusted to disability, muscle strength and mobility of the legs using a variety of setting options. If necessary, corresponding pedals from the accessories package hold the feet in place and thus enable driving by pedalling and pulling. While one leg pedals, the other is automatically flexed. If there is little or no power available to stretch one leg, the other leg can help by pulling. It is thus possible to ride the Pedalofit 2 if you suffer from single-side paralysis or even with just one leg after a leg amputation. The Speedy Pedalofit 2 can be provided with or without a support motor. Retrofitting is possible. Motor support is torque-controlled and individually adjustable in ten stages. The motor switches off above a speed of 13.5 km/h, the electrical charge of the battery pack is 15 Ah.